I've made no secret that I love the Imaginext MMPR line. It's a 100% fun way to collect toy versions of the classic characters that honestly works really well. While Imaginext is aimed towards smaller children, it does have it's share of adult collectors and Fisher Price acknowledges that often. Imaginext is essentially the modern day equivalent of Adventure People and just like Adventure People, Imaginext makes just plain wonderful toys. Their Power Rangers line doesn't give the characters much of a cutesy make over. These are essentially smaller sized figures with really neat vehicles and play sets. There's often some neat play feature integrated into the vehicles and play sets that is utilized by way of turning the figure on a base. 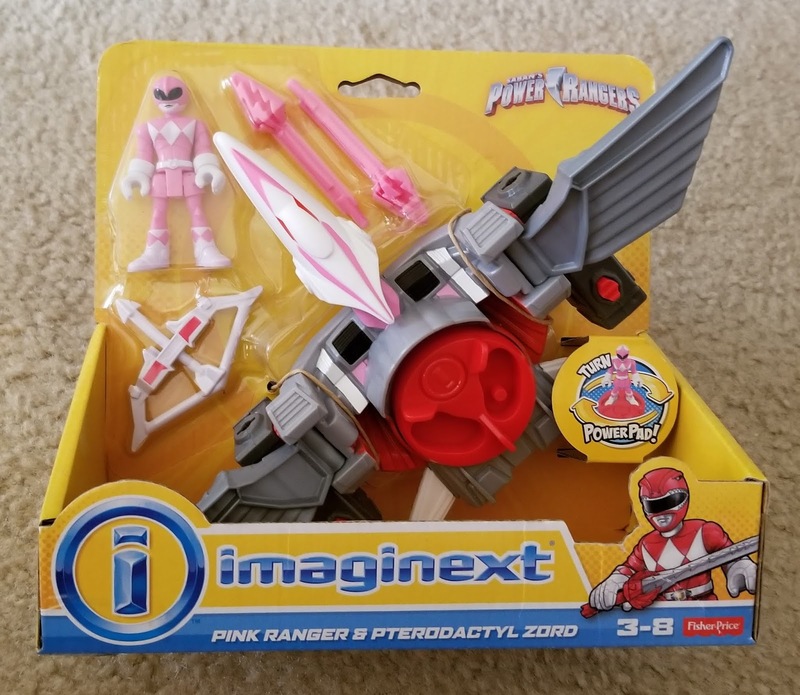 The Pink Ranger makes the Pterodactyls mouth open. Also, if you have the wings folded up, they snap back into place. Just a silly little play feature that's hard to hate. The Zord makes me think of Windstorm from Starriors a bit. Owing more to it's similar nature as a robot pterodactyl than anything, I'm curious if a blue version might find it's way out at some point just as a robot figure turns up in the blind bags. Imaginext is crafty like that sometimes. 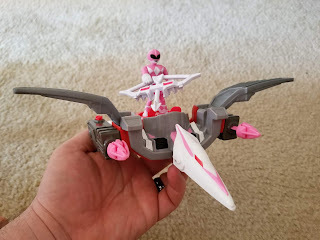 As you can see, the Pink Ranger stands on her base to pilot the Zord in a satisfying manner and even has some firing rockets. 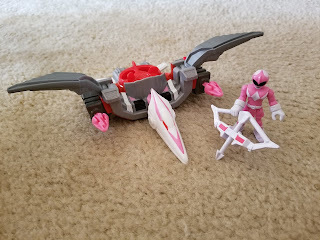 I've already got the Pink Ranger from the figure two pack, and just like the other Rangers that come with standard versions of the Zords, they are the same figures without the variations that run throughout the line. So really, if you missed the two pack, here's another with the bow for the combining Power Cannon. Imaginext toys are really hefty and satisfying. I had been passing on this Zord set as I already have the regular figure from the two pack. Though when I saw it in my local Walmart's spring clearance section for $4, there was no way I was passing on that deal. Which I'm really happy about as my track record with these larger Zords has been all positive. These are just wonderful old school Adventure People style sets themed to a series I really love and it works amazingly well. I'd argue better than normal Power Rangers toys. This set is normally around $14 on average, so $4 was such a steal I expect the police to knock down my door any minute. I think the best example of just how neat these toys are can be summed up in the Zord's hidden form. 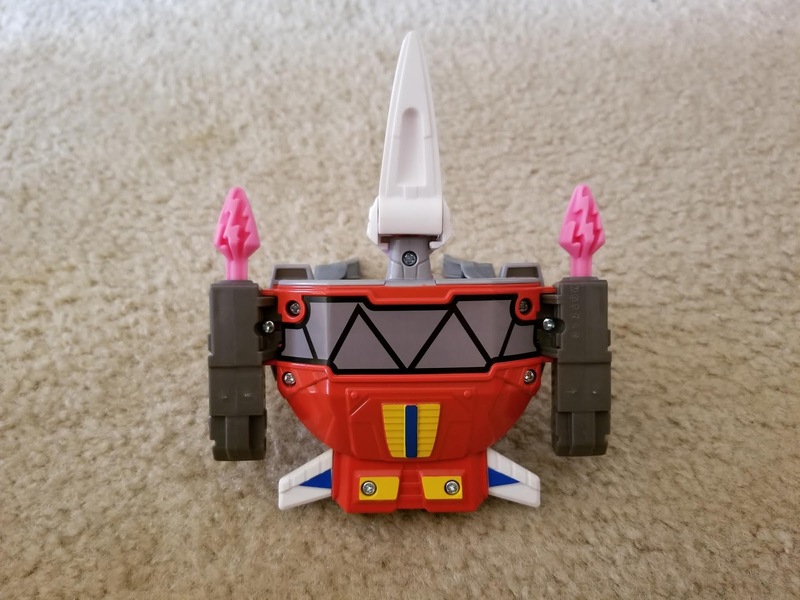 Despite the sets not being able to combine to form the Megazord, you can still convert the Pterodactyl into it's chest formation. 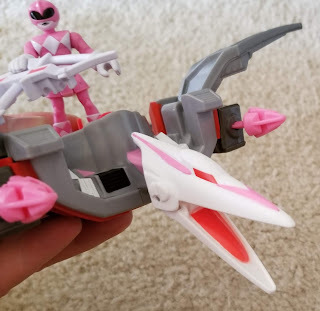 It's not a happy accident either, they took time to paint and deco up the Zord's underside just for this detail and really could have skipped it. See what I mean when I say these are arguably better toys than the normal toys? I do worry that when Hasbro's toy control kicks in that the Imaginext line will eventually go away and Playschool will take over. Which, could be awesome. Playschool makes great similar figures and I'd wager they'd possibly explore other series than MMPR. Just, man, Imaginext is really nailing it. It's going to be a tough act to follow.